Choosing the best places to stay in Hawaii is hard work. Many of them have amazing views, private beaches and extraordinary resort facilities. Some are lodged deep in the jungle, whilst others are right in the heart of the action. All of our Guru’s recommendations for the best places to stay in Hawaii are worthy of a daydream or two. There’s probably no island group more synonymous with the daydream of a tropical island paradise. Hawaii is as beautiful as you can imagine. Photoshop not required. The beaches are sandy white, fringed with palm trees, the lagoons are gradients of aqua and the coral reefs bursting with colour. There are lush tropical jungles hiding volcanoes and sky-scraping waterfalls. And, of course, there's the vibrant traditional culture. Most people will start their Hawaiian holiday in Honolulu on O'ahu, and it’s worth spending at least a couple of days in this busy tropical capital. As well as having a number of Hawaii’s best museums and the U.S.’s only royal palace, Honolulu also has a great foodie scene and lively nightlife. And it’s certainly not lacking in natural beauty, or perfect beaches - Waikiki Beach is probably the most famous tourist attraction in Hawaii. Once you get beyond Honolulu then Hawaii offers one tropical idyll after another. First up let’s talk about the Island of Hawai’i, or the ‘Big Island’. The largest and most dramatic in the group, this is where you might see lava pouring, steaming into the ocean. As well as the ever-changing shape of the island, Hawai’i’s lava deserts, potentially snow-capped peaks, and range of coloured sand - including black, white, gold and green - makes this a pretty memorable tropical island destination. Just off the Island of Hawai'i you'll find little Lana'i. It's known for its stunning beaches, marine reserve and archaeological site. Next comes Maui, island of many beauties and many adventures. Everything you do here comes with a spectacular backdrop which varies from lava flows, to sky scraping waterfalls, to lush jungles, tropical gardens, bamboo forests, peaks, cliffs and of course as near-to-perfect beaches as you’ll find. Go visit the moving USS Arizona Memorial, created to remember those who lost their lives during the Japanese attack on Pearl Harbour. Hike through the stunning Waimea Canyon, aka "The Grand Canyon of the Pacific". Marvel at the breathtaking views and be sure to remember your camera! Or, head to the Hawaii Volcanoes National Park, complete with its own museum as well as a number of still active volcanoes. Whichever island you eventually pick, our selection of the best places to stay in Hawaii should tick all the boxes. 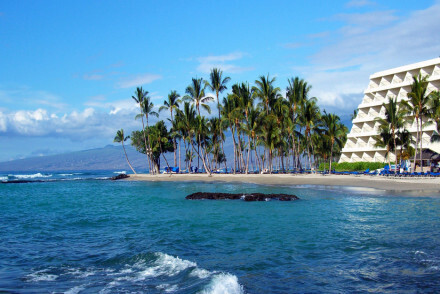 The Halekulani is a five star hotel on famous Waikiki Beach overlooking Diamond Head. There are around 450 comfortable and well-equipped rooms as well as several well regarded restaurants and extraordinary views. If you’re looking for the best place to stay in Hawaii for a city-style break then The Modern in Honolulu is a great choice. It’s a contemporary high-rise hotel with luxurious decor and wonderful sea views. There are also a handful of restaurants, four bars, two spas and a nightclub. 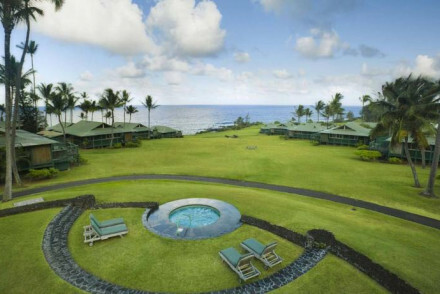 The Mauna Lani Bay Resort sits atop a lava flow, facing out towards the glorious Pacific Ocean. Luxurious, but with an eco-friendly attitude, this resort has all the mod. cons. and more, but is also known for its sea turtle rehabilitation program. The Four Seasons Hualalai has luxurious Hawaiian decor, Pacific Ocean views, seven pools, three restaurants and a private beach. They also run dolphin watching and snorkelling trips. Travaasa Hana is a collection of 70 cottages surrounded by lush jungle, with the odd break in the tropical foliage for a pool, tennis court, croquet lawn and numerous hot tubs (both private and communal). It gets better though, all of the cottages have ocean views plus there’s a great local menu. 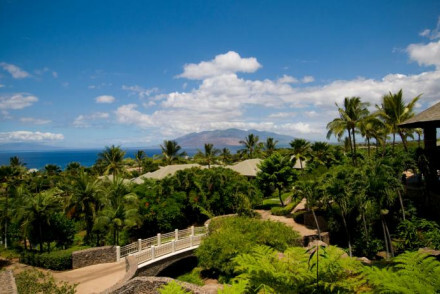 The Hotel Wailea is on Maui’s southern coast, surrounded by 15 acres of tropical gardens. As well as all the local walking it offers yoga and other fitness classes, whilst there are also lovely nearby beaches and a great Mediterranean restaurant. 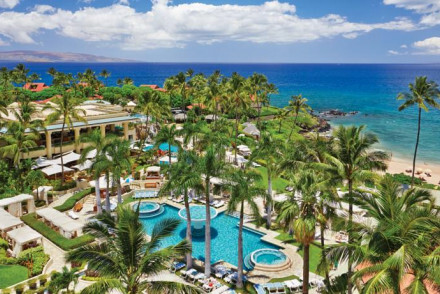 The Four Seasons Maui at Wailea is ideal if you’re looking for a tropical island resort break. There are three beautiful salt water pools, palm trees, sea views, three restaurants, complimentary canoe hire and plenty of exploring to be done nearby. Hotel Lanai offers comfortable, tastefully decorated accommodation as well as a lovely in-house restaurant. The perfect spot from which to get to know the island. 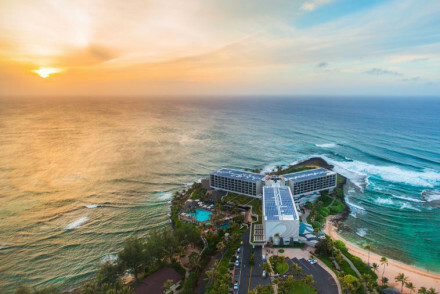 Turtle Bay Resort is a stunning choice located right on the coast of Oahu's North Shore. Boasting chic accommodation with wonderful sea views, and large terraces from which to enjoy them, there are also a variety of bars and restaurants to choose from. Hawaii's dry season runs from April to October and the nicest months are April, May, September and October - the peak of summer can often be pretty humid, especially if you're not used to it. International visitors can fly into Daniel K. Inouye International Airport, located in Honolulu. From the airport, you can take a bus or shuttle to other parts of the island. Each island has its own airport, so if you're headed elsewhere then you can easily catch an inter-island flight from Honolulu. Browse through our list of all the best places to stay in Hawaii. 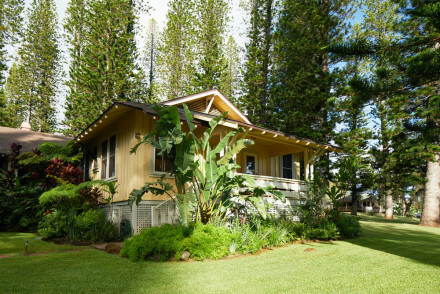 Historical landmark on Lanai Island offers comfort, prime location and privacy. Rooms are spacious and contemporary. Lana'i City Grille is renowned on the island and offers family-style sharing plates. From Hotel Lanai explore by land or by sea, a truly great spot and place to escape to for a break. Diving - Scuba diving in such clear waters is a real must for fans of the ocean and sea world. Fishing - Deep sea fishing out of Manele Harbour and along the coastline. Sailing - Triology Sunset sail for a romantic memory on the sea. 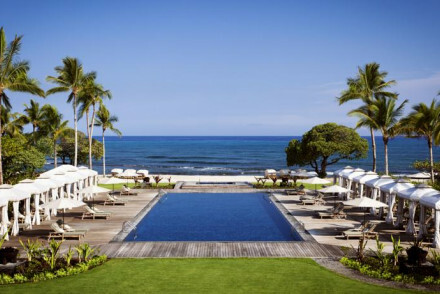 A chic Hawaiian resort on the world-famous surf area of Oahu’s North Shore. Contemporary rooms feature luxury bathrooms, floor to ceiling glass doors and large terraces. Numerous bars and restaurants leave guests spoilt for choice. Find an array of outdoor pursuits. Perfect for family holidays. Beach Life - Be it surfing or sunbathing that takes your interest the beach is pristine and just steps from the property. Families - Endless activities to keep everyone entertained. Great walks - Take picturesque coastal walks and stop for swims along the way. Surfing - Oahu’s North Shore is world famous for its surfing. High rise resort and contemporary luxury inside. Rooms are light, fully equipped with some offering sea views. Handful of restaurants, four bars, two spas and a nightclub when the day of relaxing is over. The perfect destination for a city breaks in the heart of Hawaii's capital. Local markets - Farmers markets showcase freshly baked goods, home grown fruit and veg and local cuisines. Fishing - Go deep sea fishing. 70 ocean view cottages in 70 acres of lush tropical gardens that house a pool, tennis court, croquet lawn and various private and communal hot tubs. High ceiling and contemporary in decor, rooms are luxurious with private seating and scenic views. The menu is locally inspired and created for all. Fishing - See how the fishermen do it with throw net fishing. Views - All cottages have views of the ocean. Great walks - Go see the spectacular waterfalls. This seaside spot is picture perfect. Between three salt pools, 24 hour fitness studios, the three restaurants and countless activities there truly is something for everyone. Rooms are modern and luxurious with sea views. Perfect for relaxing, local beach exploring or romantic island life getaways. Kayaking - Complimentary outrigger canoes for all. Great walks - Walk along Makena Beach State Park. Views - Sea views to die for. Seaside - Hawaii at its finest. Sitting in 15 acres of tropical gardens on the Maui's southern coastline are luxurious and spacious rooms for romantic getaways and adventurous couples. The award winning Capische offers Mediterranean dishes. Fitness and yoga are on tap,the beaches are a must and the setting oozes intimacy and calm. Great walks - Through the tropical gardens and pick the exotic reigional fruit. Remote - Sitting in 15 acres of lush tropical gardens. Views - Stunning views on the sea. Romantic - Designed for couples. 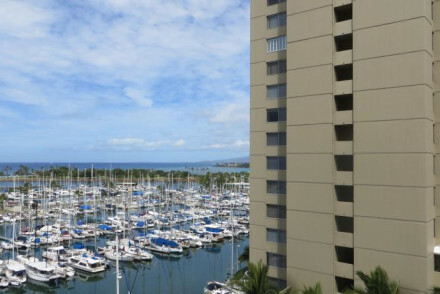 Five star luxury in an unbeatable location on Waikiki Beach, overlooking Diamond Head. Rooms are contemporary, large and well equipped. Award winning restaurants on site offer a variety of cuisines & all feature locally sourced produce. Ideal for an active beach break, with city benefits too! Atop lava flows, Pacific Ocean facing and oozing Hawaiian culture and decor, this eco, luxury hotel is contemporary and mirrors island life. With two restaurants to try, a spa and fitness centre, tennis coaching and two golf courses - there is a lot to do. The perfect family holiday by the sea. Back to Nature - This resort is known for its sea turtle rehabilitation program. Kayaking - Kayaks, canoes and surf boards are all avaliable to hire. Sights nearby - Free trips to see the lava tubes. 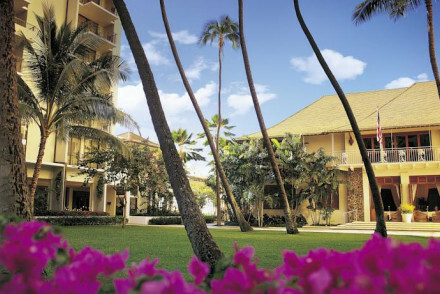 Manicured gardens, Pacific Ocean views and luxurious rooms with Hawaiian decor. Seven pools, three restaurants and two lounges, with ample space to relax, unwind and stroll along the private beaches. The spa, dolphin watching, zip-lining and snorkeling are some of the activities readily available. Great walks - Walking around the island is a must. As well as zip-lining for more adrenaline. Kayaking - Closer to shore, get involved in paddle boarding and outrigging canoing. Sights nearby - Enjoy a two hour helicopter ride to the nearby active Kilauea volcano.